The project started with the idea to make the whimsical design from our website actually move. The first thing that popped into my mind is that the chain and sprocket arrangement wouldn’t actually work. You can’t have both chains from one sprocket travel in the same direction! I thought about it for a while and realized that idler sprockets would be a great solution. Chain has enough play that you can get it to bend out of plane just a little bit. I spent a fair amount of time playing the the art work digitally. I first scaled it up to be a little less than 8′ wide. The size of signs frequently surprises people. Looking at something high up and far away makes it look deceptively small. When you’re building one, you have to make it as big as you feasibly can. Having the sign be made out of a 4’x8′ sheet of material is a huge plus. And rather than try and make it exactly 8′, it’s always better to make it a tad smaller and allow for easier machining. I converted the image into an Illustrator file and tweaked it to fit well. I had to get a few more decorative shapes from our creative department and I was ready to see how it would all fit together in 3D. I spent the time CADing up each bearing and sprocket, to make sure there wouldn’t be an clearance issues. Creating the Solidworks files was a longer term investment. 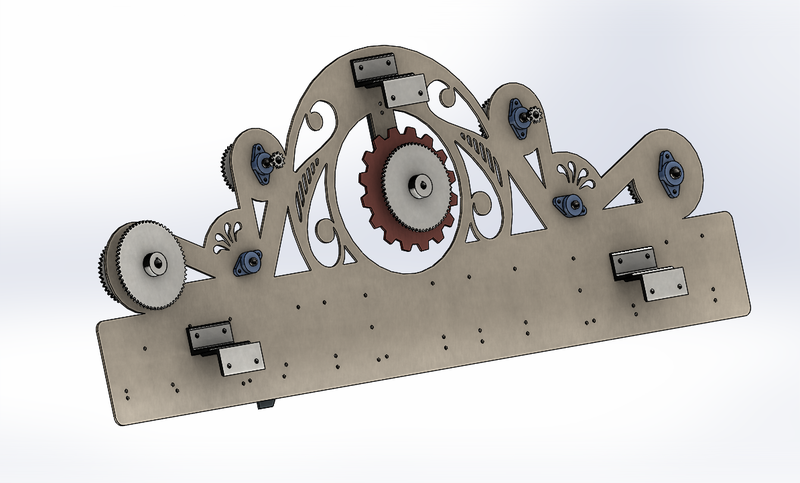 I know I’d like to use Solidworks to make other contraptions, so I might as well get started now. Once I was happy with the placement of the mounting holes, and I was convinced that this thing would actually work, I started ordering parts. 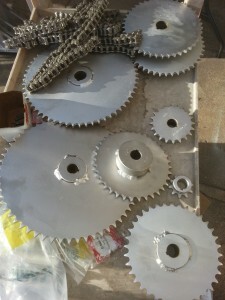 I placed my orders for laser cut steel, sprockets, bearings, and lots of chain. They took a few weeks to all arrive, but I quickly brought them outside and started putting them together. I was absolutely thrilled when all of the pieces actually fit! The chain rubbed just a little bit, but I knew I could fix it with a washer as a spacer and some light re-alignment on the bearings during the final assembly. I took it all apart again to apply the finish. All of the steel plate went out for powder coating. The color selection of powder coatings is very much different than paint, and things I’m used to. We settled on some colors that would be close enough to our brand colors. The sprockets and steel shafts went out to be nickel plated. They had to put a very thin layer so the shafts could still fit in the bearings. But, it’s definitely worth nickel plating to keep the whole thing from becoming a disgusting color of rust. Meanwhile I started prepping the wall to hold the sign. 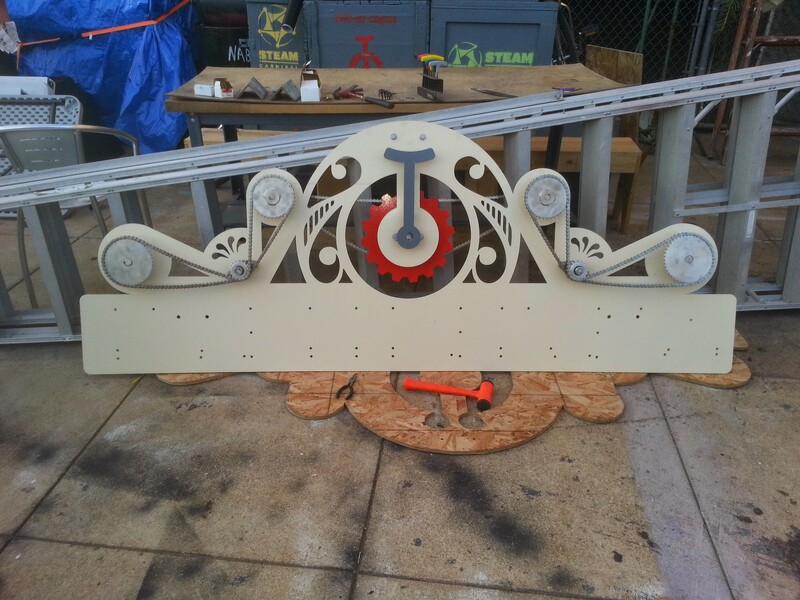 I made a full-size wooden template and I bolted my angle iron supports onto that. 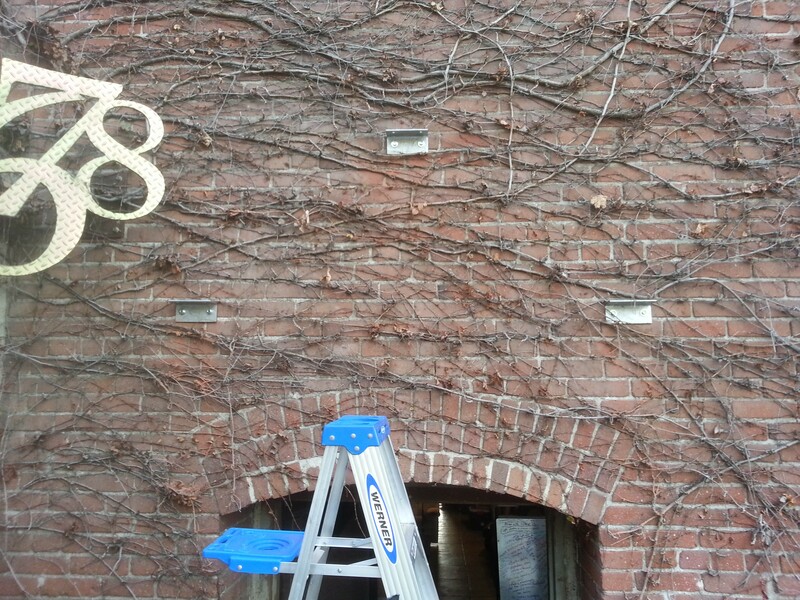 Then I could mark, drill, and glue the mounts into our brick wall. Our wall is over 100 years old, and the brick is soft and the mortar crumbly. So, I used a very strong construction epoxy to glue the anchors into wall. 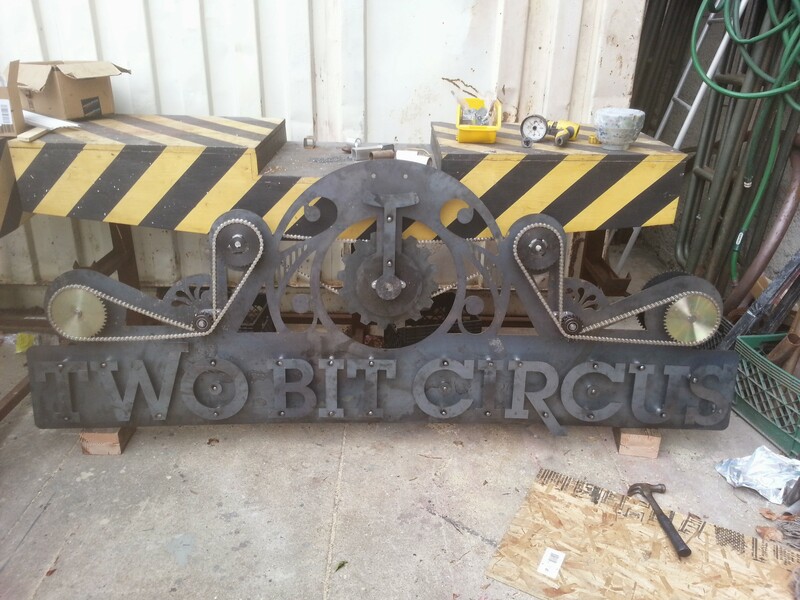 The all metal sign weighs about 300 lbs, so there’s no point in messing around. I want to be able to climb on this thing when I’m done. After a few weeks all of the parts were back form their respective finishing operations. 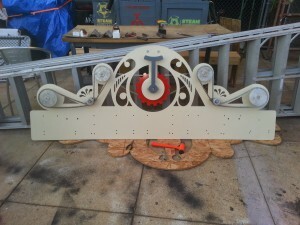 The sprockets looked great and the colors from the powder coating were rich and protective. Next it was time for final assembly! 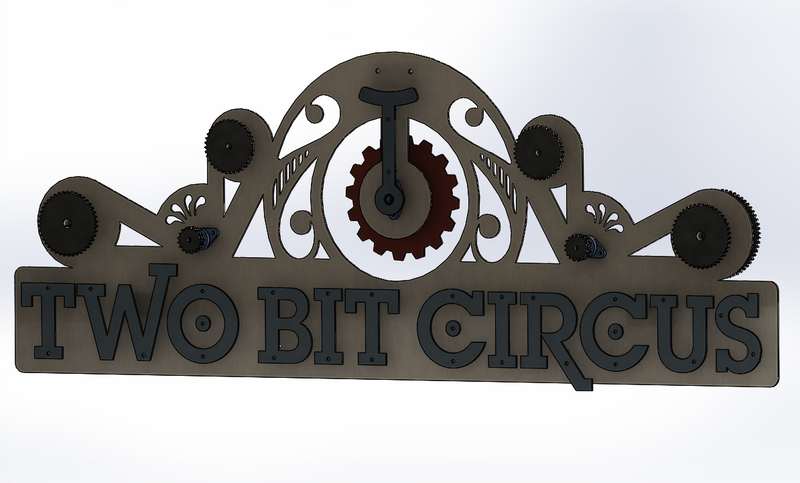 I put all of the bearings, shafts, and sprockets on the sign, but left the letters for later. I rounded up some strong backs and we hoisted the sign up onto the wall. The angle iron mounts in the back lined up perfectly. I slid some bolts into place and we were all able to step back without anything falling! I then went back and put all of the letters into place. Wherever I could I used stainless steel hardware. The chain and sprockets are nickel plated and will hopefully put up with years of abuse and weather. But, this is Southern California, so it doesn’t have to deal with too much. It was an absolute pleasure designing, CADing, testing, assembling, and mounting this fantastic piece of artwork. I’m extremely proud of how it turned out. It took a lot of work, but I think amazing signage is worth it. It literally is the first thing people see about our business. 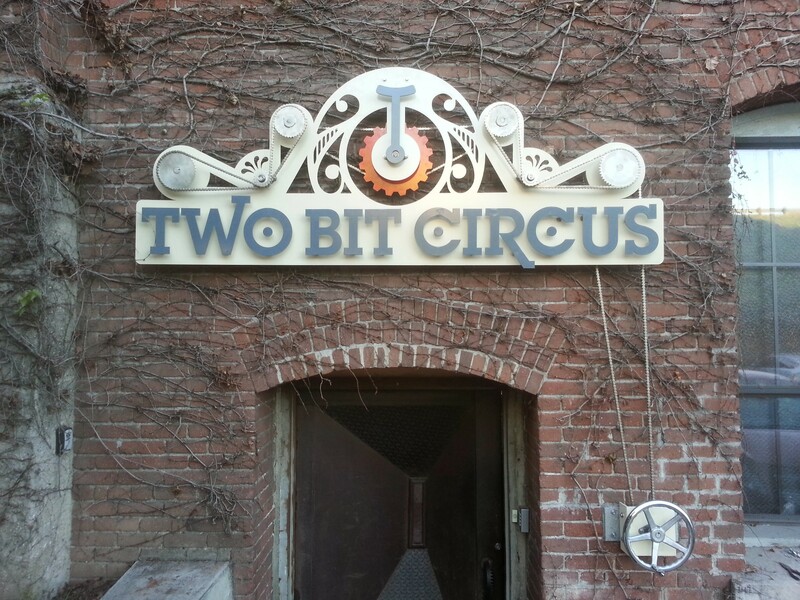 If you’re ever in the area, swing by and give the handwheel a crank!